I’m really unsure on why you’re here. There truly is nothing to see. Like, nothing at all. There is no daily download for April. Nope. Not a one. Sorry! Oh, you didn’t fall for that, did you? Well, April Fool’s! 😀 But I can’t show the new one to you, just yet! I’m going to show you March’s first, the full reveal! Isn’t it wonderful? 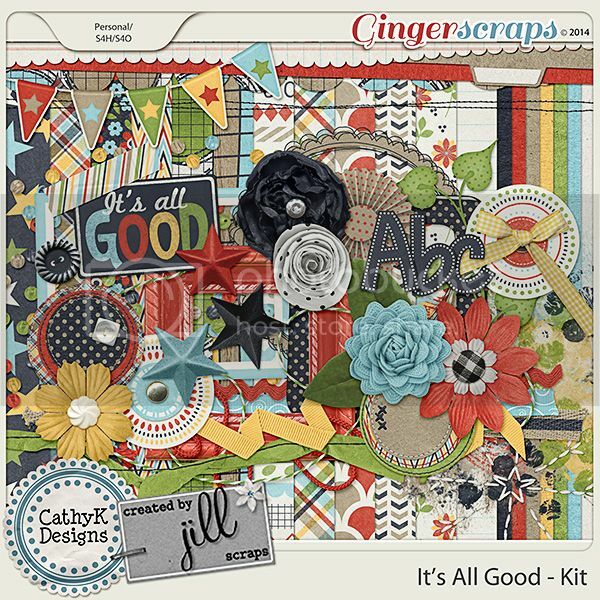 Thank you CathyK Designs and Created by Jill Scraps for sharing this wonderful kit with us! 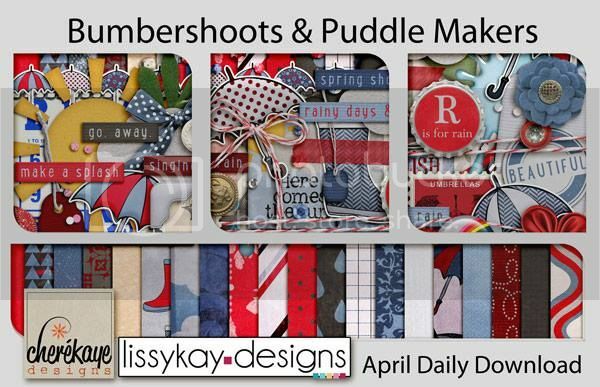 April’s kit follows the theme of April Showers. It’s full of fun rain and water references. It’s a beautiful collab between Cherekaye Designs and LissyKay Designs! It’s the end of the month, literally, only a few hours left, maybe even less depending on your time zone! Stephanie has put together these two interviews of our March Feature Designers. It’s been a fantastic month and double the fun with TWO designers! Hi everyone, dropping in to showcase our TWO (yes, two) featured designers for March. 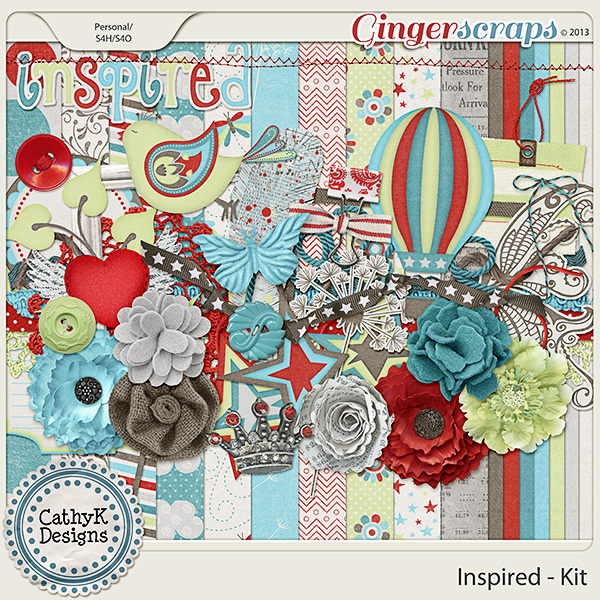 CathyK Designs and Created by Jill Scraps have teamed up this month to the designers in the GingerScraps spotlight. These ladies have designed a couple of my favorite (and most used) kits. My design process varies a little, depending on how I get started. Sometimes, the color palette comes first, then I pick a theme that goes with it. Sometimes, I have a theme in mind, then work up a color palette to go with the theme. Once I have a color and theme, I always do papers first, then elements, then alphas and any other addons. I use Photoshop CS4 for the majority of my design work and Inkscape for any illustrations I need to do. My workspace is a big computer hutch in our Family Room. I have an aging desktop computer (hope to replace it soon) and a brand new 22″ flat screen monitor. My sons are often in there watching TV, playing video games, or just hanging out. Right now, my son is watching a crazy movie about a homicidal car tire that blows up people with its mind. Obviously, I get my best work done while they are at school or after they go to bed! Let’s see, color, everyday life, my sons’ activities and interests, magazines, Pinterest, textures, a song, a good quote. Really, anything can be the inspiration for a product! Coffee with flavored creamer or lattes, please. I’m trying to drink more tea, but I just don’t like it much. I have found a vanilla Rooibos tea that I like, that has the benefits of green tea without the green tea flavor. I love flavored creamers too. Plain creamer is just boring. Do you craft outside of the digital world? I used to craft all the time, until I found digital scrapbooking. Now, most of my crafting is digital. Hobbies in addition to crafting? I like hiking and camping, bike riding, reading, and just hanging out with my family. How do you feed your sweet tooth? My favorite dessert of all time is pecan pie, which I only have around the holidays. I also love coconut cream pie ice cream from a local ice cream shop here. I *need* to find some of this coconut cream pie ice cream. What is your *favorite* kit you’ve designed and why is it your favorite? Oh, WHY do you want me to choose between my babies? I guess I would have to choose my Inspired Collection. I designed this for the December Buffet, and I LOVE the bright, happy colors and all the fun elements. What is your favorite thing about GingerScraps.net? My favorite thing about GingerScraps is the friendly, helpful people that make up this wonderful community! I think Google Chrome is my most-used app. I don’t like the Facebook app, so I use Chrome to access Facebook and one of my webmail accounts. Starbucks decaf skinny hazelnut latte. I’ve been designing over 7 years now. Keep up with Cathy on Facebook and her blog. You can also check out all of her fabulous kits in her store. That’s a good one! I mainly go with the flow…sometimes I’ll start with papers…then have an idea for an element…switch to that…then maybe a journal card saying comes to mind…I’m all over the place! I use PS CS5 with an occasional splash of Snap Art or Art Rage! It could be a palette, a mood, something one of my teenagers say….it could be anything! Has to be one of the Argeneau Series books by Lynsay Sands….addicted to her stuff…modern day vampires (immortals as they refer to themselves) with a neat twist. Hobbies in addition to crafting? I wish…I’m not crafty at all! Please share a photo of yourself, one that shows us YOU. One of my “happy places” is when I’m teaching Zumba. In this picture I had just arrived at my very first Zumba Convention in Orlando in 2012 (still on the bus from the airport). Via Facebook I had gathered together 400 “newbies” and a bunch of us were going to meet poolside at the Hilton. They called me the Pack Leader so I had to get the hat made! Can you tell I was excited?? Oooooh…that’s a hard one….I think my current favorite is from the March Buffet…Hello There! Love the colors….it’s so spring-y! It’s a warm and welcoming pace to be! Everyone is just fantastic! It’s a tie between Facebook and Candy Mania. I think Facebook is mine too. Makes it so easy to stay connected everywhere. These amazing Italian caramels you can only get via mail (unless you live in the eastern shore in Maryland) I can go through a box in days (and that’s with some control!) I grew up with them and still order a pound every now and then. Matter of fact my father sent me a pound for my birthday! I’d say about 5-6 years….but I really have no clue…it’s something I stumbled into…when? I can’t really say….I feel like I’ve always been doing this! Sweet….THEN salty! Must have the 2! If you could travel to any TIME in the past, present or future where would you go and why? 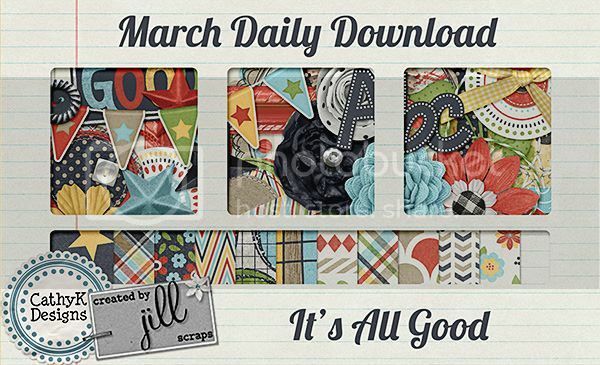 Make sure to follow Jill on Facebook, her blog, and see all her designs in her store. I have to agree with both of these lovely ladies that GingerScraps.net is warm, welcoming, and a helpful place to hang out. I’ve gotten some great help, guidance and inspiration since I joined.